Morse Reservoir, a water supply reservoir, is located in Hamilton County, Central Indiana, approximately 20 minutes north of Carmel and 45 minutes from downtown Indianapolis. It takes about one hour to reach the Indianapolis International Airport. Located on Cicero Creek and built by the Indianapolis Water Co. in 1952. Known as the taller, skinnier brother of the popular Geist Reservoir, Morse Reservoir in Hamilton County offers nearly the same acreage of boating pleasure, minus ...Learn more here! Morse Reservoir, a water supply reservoir, is located in Hamilton County, Central Indiana, approximately 20 minutes north of Carmel and 45 minutes from downtown Indianapolis. It takes about one hour to reach the Indianapolis International Airport. Located on Cicero Creek and built by the Indianapolis Water Co. in 1952. Known as the taller, skinnier brother of the popular Geist Reservoir, Morse Reservoir in Hamilton County offers nearly the same acreage of boating pleasure, minus the crowds. In fact, it is widely known that even though both Geist and Morse share the same slips and boat ramp on Morse Lake Marina, the slip waiting list is far shorter at Geist. Here you will find all forms of boating fun, as well as an abundance of quiet, solitary, places where a fisherman can cast a line on the shore. Just make sure your fishing license is current before you take out your rod and reel -- many fishermen have come away with fines due to local State Fishery crackdowns. Morse Lake has approximately 1,500 acres of water and 33 miles of shoreline. It is this shoreline that attracts so many families to live on or near the water. Waterfront prices start at $325,000 and can reach $1 million+. Off the water, prices run from $175,000 to $350,000. Morse Reservoir was stocked with a variety of fish years ago. Bluegill, large-mouthed bass, channel catfish, and crappie are among the varieties most commonly caught. Jim Raymer of Greenfield, Indiana knew he probably had a state record fish as soon as he pulled the big yellow bass from Morse Reservoir. On Nov. 4, Raymer hauled in a 2-pound, 15-ounce yellow bass while fishing for crappie at Morse Reservoir in Hamilton County. His catch measured 16.7-inches long and had a 12.7-inch girth. The fish bested the past state record by 11-ounces. The current International Game Fish Association all-tackle sport fishing world record yellow bass is a 2-pound, 9-ounce Duck River fish caught near Waverly, Tenn. Most yellow bass weigh mere ounces, but these scrappy little fighters are abundant in some waters and can provide hours of excitement on ultralight tackle. For many years, a 2-pound, 4-ounce Monroe Lake specimen was the world's largest officially documented yellow bass. Morse Reservoir is designed for all types of boating activities with special areas for water-skiing and sailing. Oakbay provides a close-knit community on the waterfront. 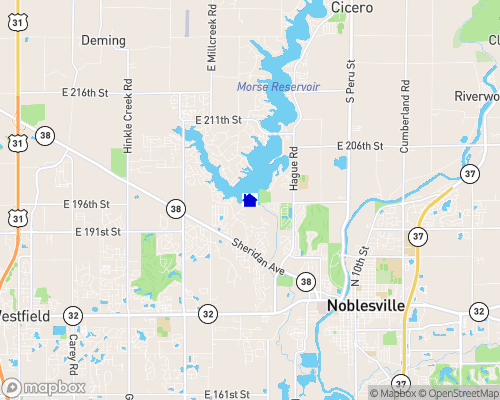 Located north of Carrigan Road along the Morse Reservoir, north of Noblesville. First home was built about 1988, about half of the neighborhood is 5 years old or less. Style of Homes: Two-story homes, typically brick, most with basements and medium-size yards, sidewalks except on cul-de-sacs. Amenities: Swimming, boating, jet skiing on reservoir as well as fishing. Harbor Trees Golf Course nearby, mostly newer homes. Commute to Downtown: 40-50 minutes. Schools: Noblesville schools. Neighborhood Association: Oakbay Property Owners Association. Tucked away on the edge of Morse Reservoir, Crystal Lake is a relaxed small community consisting of just 30 home sites. Crystal Lake is located east of Hague Road off of Dakota Drive, just a few blocks south of the Morse Marina. Crystal Lake features over 7 acres of common area that includes a children's play area and a basketball court. Homes start in the low 100's and lots are just $18,000. Prairie Crossing is the most affordable golf community in Hamilton County. Located minutes from Morse reservoir and quaint Noblesville shopping, this community has much to offer. Golf course, wooded and lake views are available. I Live, Work & Play On Morse Lake! See Homes By Boat!